Summary: This action involves writing and sending a letter from your organization or community to Dow Constantine endorsing the People’s Moratorium to halt youth jail construction. Inundate Dow Constantine’s mailboxes with broad based support for the People’s Moratorium on the new youth jail. Share your story. What’s your stake in this campaign? Do you work with families or youth? Are you an educator? Do you represent a faith community whose beliefs are in contradiction with jailing kids? The more specific, unique, and personal, the better! Make the ask: Ask the county to place an immediate moratorium on construction of the jail so that meaningful dialogue and negotiation can take place between the County and community members to repurpose the site for basic human needs and implement an end to youth detention. No dialogue can be considered meaningful or in good faith if construction is ongoing with no plans to stop. King County’s policing and imprisonment systems, including the criminalization of youth, are widely understood to be racially targeted and to criminalize poverty. King County’s efforts to reduce juvenile detention have primarily benefited white youth. As the jail population has decreased, racial inequities in youth detention have grown. The child welfare system, part of which will be housed in the new courts on the site, targets Black and indigenous families and produces terrible health, education, and employment outcomes for foster youth. The project was mischaracterized as a “Children and Family Justice Center” on the tax levy, when in reality it is a jail and courts that will target and harm low-income families of color. ∗∗∗∗ Even if a new facility houses youth services, youth should not have to be arrested to access services. Dow can halt the youth jail now and engage in a community-led negotiation to repurpose the site to actually meeting basic human needs instead of jailing youth. 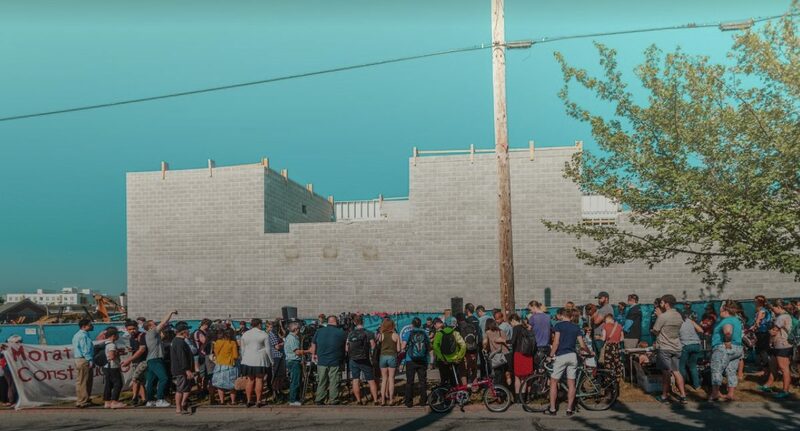 Dow has consistently avoided engaging with community concerns about this jail, most recently declining to participate in a public debate about the project with community leader Nikkita Oliver. Dow also failed to attend his own State of the County Address when confronted with community members displaying opposition. Why is Dow hiding from critique from his constituents and demands for community-led solutions? No dialogue or negotiation about the jail is genuine if construction is ongoing. Construction must be paused in order for conversation with community members about repurposing the site to be meaningful. A Youth Jail is the wrong project. We don’t need more jails and courts, we need real solutions: investments in child care, housing, income support, health care, etc. It’s not too late to repurpose these building shells for a use that actually benefits youth and families and ends youth detention. Seattle Mayor Jenny Durkan just paused a streetcar project because it’s $23 million over budget. King County can stop the youth jail which is already at least $20 million over budget, and has no guaranteed funding stream. King County needs to follow that example and be fiscally responsible. Funding for the $233 million project is in jeopardy, as the Washington Court of Appeals found that the tax levy intended to fund the project was was unlawful. Continuing with construction without a secure funding source is fiscally irresponsible, and puts key County programs and services at risk. More: you can find more talking points, citations, and resources in the #NoNewYouthJail official letter demanding a Moratorium. Add your own: personalize your letter. Offer how a new Youth Jail is in conflict with your organization’s mission and vision, or how it is in conflict with your faith. Cite scripture, studies or reports your org has done, etc. Emphasize the ASK: the ask is for the county to place an immediate moratorium on construction of the jail so that meaningful dialogue and negotiation can take place between the county and community members most impacted by the criminal justice system. No dialogue can be considered meaningful or in good faith if construction is ongoing with no plans to stop. We can reach more people and build a stronger base of support for the #PeoplesMoratorium if we share our support among our communities and networks. Post your letter on your organization’s website or blog!